The American Express Company, also known as Amex, is an American multinational financial services corporation headquartered in Three World Financial Center in New York City. The company was founded in 1850 and is one of the 30 components of the Dow Jones Industrial Average. The company is best known for its charge card, credit card, and traveler's cheque businesses. In 2016, credit cards using the American Express network accounted for 22.9% of the total dollar volume of credit card transactions in the US. As of December 31, 2017[update], the company had 112.8 million cards in force, including 50 million cards in force in the United States, each with an average annual spending of $18,519. In 2017, Forbes named American Express as the 23rd most valuable brand in the world (and the highest within financial services), estimating the brand to be worth US$24.5 billion. In 2018, Fortune ranked American Express as the 14th most admired company worldwide, and the 23rd best company to work for. The company's logo, adopted in 1958, is a gladiator or centurion whose image appears on the company's traveler's cheques, charge cards and credit cards. In 1850, American Express was started as an express mail business in Buffalo, New York. It was founded as a joint stock corporation by the merger of the express companies owned by Henry Wells (Wells & Company), William G. Fargo (Livingston, Fargo & Company), and John Warren Butterfield (Wells, Butterfield & Company, the successor earlier in 1850 of Butterfield, Wasson & Company). Wells and Fargo also started Wells Fargo & Co. in 1852 when Butterfield and other directors objected to the proposal that American Express extend its operations to California. 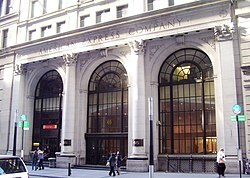 American Express initially established its headquarters in a building at the intersection of Jay Street and Hudson Street in what was later called the Tribeca section of Manhattan. For years it enjoyed a virtual monopoly on the movement of express shipments (goods, securities, currency, etc.) throughout New York State. In 1874, American Express moved its headquarters to 65 Broadway in what was becoming the Financial District of Manhattan, a location it was to retain through two buildings. In 1854, the American Express Co. purchased a lot on Vesey Street in New York City as the site for its stables. The company's first New York headquarters was an 1858 marble Italianate palazzo at 55–61 Hudson Street, which had a busy freight depot on the ground story with a spur line from the Hudson River Railroad. A stable was constructed in 1867, five blocks north at 4–8 Hubert Street. The company prospered sufficiently that headquarters were moved in 1874 from the wholesale shipping district to the budding Financial District, and into rented offices in two five-story brownstone commercial buildings at 63 and 65 Broadway that were owned by the Harmony family. In 1880, American Express built a new warehouse behind the Broadway Building at 46 Trinity Place. The designer is unknown, but it has a façade of brick arches that are reminiscent of pre-skyscraper New York. American Express has long been out of this building, but it still bears a terracotta seal with the American Express Eagle. In 1890–91 the company constructed a new ten-story building by Edward H. Kendall on the site of its former headquarters on Hudson Street. By 1903, the company had assets of some $28 million, second only to the National City Bank of New York among financial institutions in the city. To reflect this, the company purchased the Broadway buildings and site. At the end of the Wells-Fargo reign in 1914, an aggressive new president, George Chadbourne Taylor (1868–1923), who had worked his way up through the company over the previous thirty years, decided to build a new headquarters. The old buildings, dubbed by the New York Times as "among the ancient landmarks" of lower Broadway, were inadequate for such a rapidly expanding concern. American Express sold this building in 1975, but retained travel services there. The building was also the headquarters over the years of other prominent firms, including investment bankers J.& W. Seligman & Co. (1940–74), the American Bureau of Shipping, a maritime concern (1977–86), and currently J.J. Kenny, and Standard & Poor's, who has renamed the building for itself. American Express extended its reach nationwide by arranging affiliations with other express companies (including Wells Fargo – the replacement for the two former companies that merged to form American Express), railroads, and steamship companies. 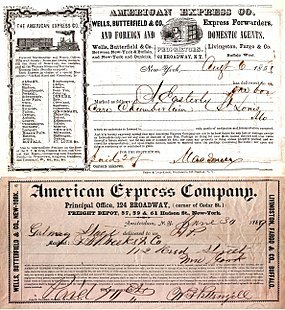 In 1857, American Express started its expansion in the area of financial services by launching a money order business to compete with the United States Post Office's money orders. Sometime between 1888 and 1890, J. C. Fargo took a trip to Europe and returned frustrated and infuriated. Despite the fact that he was president of American Express and that he carried with him traditional letters of credit, he found it difficult to obtain cash anywhere except in major cities. Fargo went to Marcellus Flemming Berry and asked him to create a better solution than the letter of credit. Berry introduced the American Express Traveler's Cheque which was launched in 1891 in denominations of $10, $20, $50, and $100. Traveler's cheques established American Express as a truly international company. In 1914, at the onset of World War I, American Express in Europe was among the few companies to honor the letters of credit (issued by various banks) held by Americans in Europe, because other financial institutions refused to assist these stranded travelers. The British government appointed American Express its official agent at the beginning of World War I. They were to deliver letters, money and relief parcels to British prisoners of war. Their employees went into camps to cash drafts for both British and French prisoners and arranged for them to receive money from home. By the end of the war they were delivering 150 tonnes of parcels per day to prisoners in six countries. American Express became one of the monopolies that President Theodore Roosevelt had the Interstate Commerce Commission (ICC) investigate during his administration. The interest of the ICC was drawn to its strict control of the railroad express business. However, the solution did not come immediately to hand. The solution to this problem came as a coincidence to other problems during World War I. During the winter of 1917, the United States suffered a severe coal shortage and on December 26 President Woodrow Wilson commandeered the railroads on behalf of the United States government to move federal troops, their supplies, and coal. Treasury Secretary William Gibbs McAdoo was assigned the task of consolidating the railway lines for the war effort. All contracts between express companies and railroads were nullified and McAdoo proposed that all existing express companies be consolidated into a single company to serve the country's needs. This ended American Express's express business, and removed them from the ICC's interest. The result was that a new company called the American Railway Express Agency formed in July 1918. The new entity took custody of all the pooled equipment and property of existing express companies (the largest share of which, 40%, came from American Express, who had owned the rights to the express business over 71,280 miles (114,710 km) of railroad lines, and had 10,000 offices, with over 30,000 employees). During the 1980s, American Express embarked on an effort to become a financial services supercompany and made a number of acquisitions to create an investment banking arm. In mid-1981 it purchased Sanford I. Weill's Shearson Loeb Rhoades, the second largest securities firm in the United States to form Shearson/American Express. After the purchase of Shearson, Weill was given the position of president of American Express in 1983. Weill grew increasingly unhappy with responsibilities within American Express and his conflicts with American Express' CEO James D. Robinson III. Weill soon realized that he was not positioned to be named CEO and left in August 1985. In 1984, American Express acquired the investment banking and trading firm Lehman Brothers Kuhn Loeb, and added it to the Shearson family, creating Shearson Lehman/American Express. It was Lehman's CEO and former trader Lewis Glucksman who would next lead Shearson Lehman/American Express. In 1984, Shearson/American Express purchased the 90-year-old Investors Diversified Services, bringing with it a fleet of financial advisors and investment products. In 1988, Shearson Lehman acquired the brokerage firm E.F. Hutton & Co.. E.F. Hutton was merged with the investment banking business and the investment banking arm was renamed Shearson Lehman Hutton, Inc. However, when Harvey Golub became CEO of American Express in 1993, American Express decided to get out of the investment banking business and negotiated the sale of Shearson's retail brokerage and asset management business to Primerica. The Shearson business was merged with Primerica's Smith Barney to create Smith Barney Shearson. Ultimately, the Shearson name was dropped in 1994. In 1994, American Express spun off of the remaining investment banking and institutional businesses as Lehman Brothers Holdings Inc. After almost fifteen years of independence, Lehman Brothers filed for bankruptcy protection in 2008 as part of the late–2000s financial crisis. Former CEO Ken I. Chenault took over leadership of American Express in 2001 from Harvey Golub, CEO from 1993 to 2001. Prior to that, the company was headed by James D. Robinson III from 1977 to 1993, Howard L. Clark Sr. from 1960 to 1977, and Ralph Reed from 1944 to 1960. Current CEO: Stephen Joseph Squeri since Feb 1, 2018. American Express executives discussed the possibility of launching a travel charge card as early as 1946, but it was not until Diners Club launched a card in March 1950 that American Express began to seriously consider the possibility. At the end of 1957, American Express CEO Ralph Reed decided to get into the card business, and by the launch date of October 1, 1958, public interest had become so significant that 250,000 cards were issued prior to the official launch date. The card was launched with an annual fee of $6, $1 higher than Diners Club, to be seen as a premium product. The first cards were made of paper, with the account number and cardmember's name typed. In 1959, American Express began issuing embossed ISO/IEC 7810 plastic cards, an industry first. In 1966, American Express introduced the Gold Card. In 1984, the company launched the Platinum Card, clearly defining different market segments within its own business, a practice that has proliferated across a broad array of industries. The Platinum Card was billed as super-exclusive and had a $250 annual fee (it is currently $550). It was offered by invitation only to American Express customers with at least 2 years of tenure, significant spending, and excellent payment history; it is now open to applications on request. In 1987, American Express introduced the Optima card, its first credit card product that did not have to be paid in full at the end of the month. American Express formed a venture with Warner Communications in 1979 called Warner-Amex Satellite Entertainment, which created MTV, Nickelodeon, and The Movie Channel. The partnership lasted only until 1984. The properties were sold to Viacom soon after. In April 1992, American Express spun off its former subsidiary, First Data Corp., in an initial public offering. In 1994, the Optima True Grace card was introduced. The card was unique in that it offered a grace period on all purchases whether a balance was carried on the card or not (as opposed to traditional revolving credit cards which charge interest on new purchases if so much as $1 was carried over). The card was discontinued a few years later; the now discontinued One from American Express card offered a similar feature called "Interest Protection". From early 1980s until the early 1990s, American Express was known for cutting its interchange fee (also known as a "discount rate") to merchants and restaurants if they accepted only American Express and no other credit or charge cards. This prompted competitors such as Visa and Mastercard to cry foul for a while as the tactics "locked" restaurants into American Express. Capitalizing on this elitist image, American Express frequently mentioned such exclusive partnerships in its advertising. Aside from some holdouts including Neiman Marcus (which continued exclusivity until 2011), the practice largely ended in 1991. A group of restaurants in Boston stopped accepting American Express while accepting and encouraging the use of Visa and Mastercard, including some that were exclusive to American Express. The rationale was due to far lower fees as compared to American Express' fees at the time (which were about 4% for each transaction versus around 1.2% at the time for Visa and Mastercard). The revolt, known as the "Boston Fee Party" (alluding to the Boston Tea Party), spread to over 250 restaurants across the United States, including restaurants in other cities such as New York City, Chicago, and Los Angeles. Visa offered to pay the Fee Party's legal bills, and Discover Card was able to increase their acceptance among Boston restaurants by 375%. Kenneth Chenault, then head of Travel Related Services prior to becoming American Express CEO, cut fees to bring these restaurants back into the fold. American Express then shifted its focus from exclusivity to broadening acceptance, adding mainstream merchants like Walmart to the American Express network. On November 10, 2008, during the financial crisis of 2007–2008, the company won Federal Reserve System approval to convert to a bank holding company, making it eligible for government help under the Troubled Asset Relief Program. At that time, American Express had total consolidated assets of about $127 billion. In June 2009, $3.39 billion in TARP funds were repaid plus $74.4 million in dividend payments. In July 2009, the company ended its obligations under TARP by buying back $340 million in Treasury warrants. In November 2010, the UK division of American Express was cautioned by the Office of Fair Trading for the use of controversial charging orders against those in debt. The regulator said that the company was one of four companies who were encouraging customers to turn their unsecured credit card debts into a form of secured debt. In October 2012, The Consumer Financial Protection Bureau (CFPB) announced an enforcement action with orders requiring three American Express subsidiaries to refund an estimated $85 million to approximately 250,000 customers for illegal card practices between 2003 and 2012. Allegations included that American Express made misleading statements regarding signup bonuses, charged unlawful late fees, discriminated against applicants due to age, and failed to report consumer complaints to regulators. Beginning in 2004, Costco issued co-branded American Express cards which also doubled as a membership card. Costco ended this arrangement in 2016 in the United States and in 2015 in Canada. The cards did not have annual fees and offered cash back in form of in-store rebates on certain tiers of purchases. The TrueEarnings cards issued by Costco in the United States were an extension of an exclusive credit card network deal between Costco and American Express dating to 1999. Costco was the last major U.S. merchant that accepted American Express cards exclusively. In November 2011, Neiman Marcus, which gave similar general-purpose card exclusivity to American Express since 1987, began accepting Visa and Mastercard. Costco's Canadian stores ended its exclusive deal with American Express in January 2015 in favor of one with Capital One and Mastercard. Capital One did not buy accounts and balances from American Express, which required Costco Canada members to apply for the new cards instead of automatically qualifying. On February 12, 2015, it was announced that the partnership between American Express and Costco in the United States would dissolve March 31, 2016, which was later extended to June 19, 2016. By March 2, 2015, Costco announced that Citigroup would become the exclusive issuer of Costco's credit cards and that Visa Inc. would replace American Express as the exclusive credit card network accepted at Costco's stores in the United States. The Costco deal with Visa began on June 20, 2016, and in addition to the new Citi card, Costco accepted all other Visa cards. All TrueEarnings card accounts and balances held by American Express were sold to Citigroup, and new Costco Anywhere Visa cards were sent to Costco members prior to the switch date. Concurrent with the switch to Visa, Costco no longer accepted American Express in stores, at Costco.com, or through Costco Travel. The Costco partnership represented 8%, or $80 billion, of Amex's billed business and about 20%, or about $14 billion, of its interest-bearing credit portfolio, according to Richard Shane of JPMorgan Chase & Co. The impact of losing the Costco card accounts was significant; in the first quarter without Costco cards, company profit dropped 10% and revenue dropped 5% compared to the previous year. For the fiscal year 2017, American Express reported earnings of US$2.634 billion, with an annual revenue of US$35.583 billion, an increase of 5.2% over the previous fiscal cycle. Its shares traded at over $83 per share, and its market capitalization was valued at over US$86.5 billion in October 2018. American Express ranked No. 86 in the 2018 Fortune 500 list of the largest United States corporations by total revenue. As of 31 December 2017[update], the company had 112.8 million cards in force, including 50 million cards in force in the United States, each with an average annual spending of $18,519. These include consumer, small business and corporate cards issued by American Express themselves and cards issued by its Global Service Network partners that run on its network (such as Commonwealth Bank, Westpac and NAB in Australia and Lloyds Bank and Barclays Bank in the UK). On 1 March 2017, Australia's fourth largest bank ANZ announced that it was no longer issuing American Express cards, with the support phased out entirely by August 5, 2017. American Express is the fourth largest general-purpose card network on a global basis based on purchase volume, behind China UnionPay, Visa and MasterCard. It is the 4th largest card network in the world, based on the number of cards it has in circulation. American Express is one of the partner banks to both Google and Apple's mobile wallet systems (Google Pay and Apple Pay, respectively) meaning that cardholders can use their American Express-issued cards to pay at establishments where NFC payments are accepted. American Express is best known for its Green, Gold, and Platinum charge cards. The Gold Card has recently been converted to a credit card for UK residents but remains a charge card in the US. In 1958, American Express issued its first charge card, which required payment at the end of every month. In 1966, the company issued its first gold card, in an effort to cater to the upper echelon of business travel. Its platinum card debuted in 1984. In 1999, American Express introduced the Centurion Card, often referred to as the "black card," which caters to an even more affluent and elite customer segment. The card was initially available only to select users of the Platinum card. The annual fee for the card in the United States is $2,500 (up from $1,000 at introduction) with an additional one-time initiation fee of $7,500. American Express created the card line amid rumors and urban legends in the 1980s that it produced an ultra-exclusive black card for elite users who could purchase anything with it. American Express cards issued in the United States range in cost between no annual fee (for Blue and many other consumer and business cards) and a $550 annual fee (for the Platinum card). Annual fees for the Green card start at $95 (first year free), while Gold card annual fees start at $250. Airlines: Aerolineas Argentinas, Air Canada, Air France, Alitalia, British Airways, Cathay Pacific, Delta Air Lines, Icelandair, KLM, Qantas, Scandinavian Airlines, Singapore Airlines, SriLankan Airlines, Thai Airways, Virgin Atlantic, Virgin Australia, among others. Retailers: David Jones, Holt Renfrew, Harrods, Macy's, Bloomingdales, Lowe's, Mercedes Benz, and others. A credit card aimed at young adults is called Blue, which has no annual fee and a loyalty program. A television media campaign for Blue adopted the 1979 UK Synthpop hit "Cars" by Gary Numan as its theme music. A cashback reward program version, "Blue Cash", quickly followed. Amex also targeted young adults with City Reward Cards that earn INSIDE Rewards points to eat, drink, and play at New York, Chicago and LA hot spots. American Express began phasing out the INSIDE cards in mid-2008, with no new applications being taken as of July 2008. In 2005, American Express introduced Clear, advertised as the first credit card with no fees of any kind. Other cards introduced in 2005 included "The Knot" and "The Nest" Credit Cards from American Express, co-branded cards developed with the wedding planning website theknot.com. In 2006, the UK division of American Express joined the Product Red coalition and issued a Red Card, donating with each purchase through The Global Fund to Fight AIDS, Tuberculosis and Malaria to help African women and children suffering from HIV/AIDS, malaria, and other diseases. In 2009, American Express introduced the ZYNC charge card. White in color, this card was created for people aged 20–40. American Express is no longer taking applications for the ZYNC charge card. In late 2012, American Express and Walmart announced the launch of Bluebird, a prepaid debit card similar to that of Green Dot. Bluebird is being touted as having some of the benefits of traditional American Express cards, such as roadside assistance and identity theft protection. The card can also be used as a substitute to a traditional checking account. Unlike other such cards, Bluebird is FDIC-insured. Bluebird accounts have standard FDIC deposit insurance and check writing capabilities, and customers can now have Social Security payments, military pay, Tax Return, paycheck and other government benefits deposited directly into their accounts. American Express credit cards are noted by travel guides, including Rough Guides and Lonely Planet, as being less commonly accepted in Europe than Visa or Mastercard. In an interview with an American Express spokesman in 2010 about card acceptance in the UK, the Daily Mail's financial website, This is Money, noted that "The list of places that are taking Amex appears to be growing, rather than slowing, but it seems to be a little hit-and-miss. It's not a good feeling to enter a shop, not knowing whether or not they accept the card." The company logo, a gladiator or centurion, appears at the center of the iconic Zync, Cobalt, Green, Gold, Platinum, and Centurion cards. The figure and his pose evoke classical antiquity. These cards also feature intricate border and background designs that read "American Express." The designs on these cards, especially the Green card, bear resemblance to those on United States Federal Reserve Notes. In 2005, American Express introduced ExpressPay, similar to Mastercard Contactless and Visa payWave, all of which use the symbol appearing on the right. It is a contactless payment system based on wireless RFID, where transactions are completed by holding the credit card near a receiver at which point the debt is immediately added to the account. All three contactless systems use the same logo. The card is not swiped or inserted into a smart card reader and no PIN is entered. Many merchants, in the U.S. and globally, now offer American Express contactless payment, including Meijer, Walgreens, Best Buy, Chevron Corporation, Starbucks, and McDonald's. American Express OPEN, the small-business branch of American Express, offers various types of charge cards for small businesses to manage their expenses. In late 2007, the company announced the new Plum Card as the latest addition to their card line for small business owners. The card provides a 1.5% early pay discount or up to two months to defer payment on purchases. The 1.5% discount is available for billing periods where the cardmember spends at least $5,000. The first 10,000 cards were issued to members on December 16, 2007. In 2008, American Express closed all Business Line of Credit accounts. This decision was reached in tandem with the Federal Reserve's approval of American Express's request to become a commercial bank. As of July 2016[update], American Express has several credit cards designed for small business. These include SimplyCash Plus Business Credit Card. Cash back earned is automatically credited to the cardholder's statement and other benefits are included. Other cards include the Business Platinum Card from American Express OPEN, the Business Gold Rewards Card from American Express OPEN, the Blue for Business Credit Card from American Express, Business Green Rewards Card from American Express OPEN, the Business Green Rewards Card from American Express OPEN and the Plum Card from American Express OPEN. These cards have return protection, year-end summaries and other tools to help with the business accounting and control. In 2008, American Express acquired the Corporate Payment Services business of GE, which primarily focused on providing Purchasing Card solutions for large global clients. As part of the $1b+ transaction, American Express also added a new product, called V-Payment, to its product portfolio. V-Payment is unique in that it enables a tightly controlled, single-use card number for increased control. As of July 2016[update], American Express offered several business, corporate and travel credit and charge cards and services and data and information services related to their use in the competitive markets for these cards. The online "American Express @ Work" function gives corporations a site on which to apply for, cancel or suspend cards, monitor policy compliance and track expenses. The cardholder company can create and generate reports for a corporate expense account program, including analytics and data consolidation or integration. Reports can be tailored for various sized companies. Through a Standard Expense Reporting feature in its "Manage Your Card Account site", American Express corporate cards provide cardholders access to pre-populated expense reports. The cardholder needs to annotate expenses and add out-of-pocket charges upon completion of which the report can be downloaded in electronic or paper format. American Express Corporate Card program can be used with a third-party on-demand expense management tool by Concur, a provider of integrated travel and expense management services. This tool simplifies the creation of expense account reports and the corporate approval process. Corporate card activity, including viewing statements, making payments, setting up alerts and making inquiries and disputing charges, can be managed through an account online or via mobile device through this service. The corporate cards have benefits including discounts and rebates for travel and transportation, travel and emergency help, travel insurance and baggage protection. Upgrades from the Corporate "Green" Card to the Corporate Gold Card or Corporate Platinum Card, although subject to fees and terms and conditions, have several additional benefits at each card level, such as free breakfast or late checkout at many hotels. The American Express/Business Extra Corporate Credit Card is affiliated with American Airlines and provides a 4% rebate on eligible American Airlines travel purchased with the card. American Express has a specialized corporate meeting credit card. Another specialized American Express business card is the American Express Corporate Purchasing Card, which can be assigned to individual employees or departments. Reconciliation and accounting services are available to make these functions easier for the corporation. In December 2000, American Express agreed to acquire the US$226 million credit card portfolio of Bank of Hawaii, then a division of Pacific Century Financial Corp. In January 2006, American Express sold its Bank of Hawaii card portfolio to Bank of America (MBNA). Bank of America will issue Visa and American Express cards under the Bank of Hawaii name. Until 2004, Visa and Mastercard rules prohibited issuers of their cards from issuing American Express cards in the United States. This meant, as a practical matter, that U.S. banks could not issue American Express cards. These rules were struck-down as a result of antitrust litigation brought by the U.S. Department of Justice, and are no longer in effect. In January 2004, American Express reached a deal to have its cards issued by a U.S. bank, MBNA America. Initially decried by Mastercard executives as nothing but an "experiment", these cards were released in October 2004. Some said that the relationship was going to be threatened by MBNA's merger with Bank of America, a major Visa issuer and original developer of Visa (and its predecessor, BankAmericard). However, an agreement was reached between American Express and Bank of America on December 21, 2005. Under the terms of the agreement, Bank of America will own the customer loans and American Express will process the transactions. Also, American Express will dismiss Bank of America from its antitrust litigation against Visa, Mastercard, and a number of U.S. banks. Finally, both Bank of America and American Express also said an existing card-issuing partnership between MBNA and American Express will continue after the Bank of America-MBNA merger. The first card from the partnership, the no-annual-fee Bank of America Rewards American Express card, was released on June 30, 2006. Since then, Citibank, Wells Fargo, First National Bank of Omaha, USAA, Synchrony Financial, and US Bancorp have started issuing American Express cards. Citi issues the Macy's and Bloomingdale's American Express cards along with Citi-branded cards. Wells Fargo issues American Express cards under their own brand and for Dillard's. US Bancorp issues American Express-branded cards for US Bank along with Elan Card Services, a subsidiary that issues credit cards on behalf of small to midsize banks. Some credit unions, including PenFed, also issue American Express cards. JPMorgan Chase is the largest bank and the only Big Four bank in the US that does not partner with American Express. Instead, JPMorgan made the decision in 2013 to partner with Visa on the ChaseNet closed-loop network that is similar in terms of functionality to the American Express network. Many retailers do not accept American Express cards. [specify] American Express charges merchants significantly higher fees than other credit card providers. In a court case Ohio v. American Express Co., merchants filed a class action lawsuit against American Express and claimed that charging high fees is a violation of the Sherman Antitrust Act. According to the lawsuit, accepting American Express cards costs merchants the most. In January 2017, the 2nd U.S. Circuit Court of Appeals affirmed a lower court ruling that American Express could block merchants that accept its cards from steering customers to other cards, like those offered by Visa and Mastercard. In October 2017, the Supreme Court agreed to hear the antitrust case. Amex is the largest provider of traveler's checks in the world. In 2005, American Express released the American Express Travelers Check Card, a stored-value card that serves the same purposes as a traveler's check, but can be used in stores like a credit card. AmEx discontinued the card of October 31, 2007, due to "changing market conditions" and issued refund checks to cardholders for the remaining balances. During the 1980s, American Express began purchasing stock brokerage firms as part of an expansion. In mid-1981 it purchased Sanford I. Weill's Shearson Loeb Rhoades, the second largest securities firm in the United States to form Shearson/American Express. Shearson Loeb Rhoades, itself was the culmination of several mergers in the 1970s as Weill's Hayden, Stone & Co. merged with Shearson, Hammill & Co. in 1974 to form Shearson Hayden Stone. Shearson Hayden Stone then merged with Loeb, Rhoades, Hornblower & Co. (formerly Loeb, Rhoades & Co. to form Shearson Loeb Rhoades in 1979. With capital totalling $250 million at the time of its acquisition, Shearson Loeb Rhoades trailed only Merrill Lynch as the securities industry's largest brokerage firm. After its acquisition by American Express, the firm was renamed Shearson/American Express. In 1984, Shearson/American Express purchased the 90-year-old Investors Diversified Services, bringing with it a fleet of financial advisors and investment products. Also in 1984, American Express acquired the investment banking and trading firm, Lehman Brothers Kuhn Loeb, and added it to the Shearson family, creating Shearson Lehman/American Express. In 1988, the firm acquired E. F. Hutton & Co., forming Shearson Lehman Hutton until 1990, when the firm's name became Shearson Lehman Brothers. When Harvey Golub took the reins in 1993 he negotiated the sale of Shearson's retail brokerage and asset management business to Primerica and in following year, spun off of the remaining investment banking and institutional businesses as Lehman Brothers Holdings Inc.
On September 30, 2005, American Express spun-off its American Express Financial Advisors unit, Ameriprise Financial, to its shareholders. On September 30, 2005, RSM McGladrey acquired American Express Tax & Business Services (TBS). In 2008, Standard Chartered Bank acquired American Express Bank Ltd, the international banking subsidiary of American Express for US$823 million. American Express established a Travel Division in 1915 that tied together all earlier efforts at making travel easier, and soon established its first travel agencies. In the 1930s, the Travel Division had grown widely. Albert K. Dawson was instrumental in expanding business operations overseas, even investing in tourist relations with the Soviet Union. During World War I, Dawson was a photographer and film correspondent with the German army. In March 2014, American Express announced that it signed an agreement to create a joint venture for business travel and spun off its corporate travel business as American Express Global Business Travel. The American Express Publishing Corporation published the Travel + Leisure, Food & Wine, Executive Travel, Black Ink, and Departures magazines until October 1, 2013, when it sold those titles to Time Inc. It publishes American Express Skyguide and is based in New York City. As of February 2014[update], Time Inc. is restructuring the portfolio of publications. American Express FSB (federal savings bank) is a direct bank offering a standard savings account to individuals. Checking account services are not provided. In 1975, David Ogilvy of Ogilvy & Mather developed the highly successful "Don't Leave Home Without Them" ad campaign for American Express Traveler's Cheques, featuring Oscar-award-winning actor Karl Malden. Malden served as the public face of American Express Travelers Cheques for 25 years. In the UK, the spokesman was the television personality Alan Whicker. After Malden's departure, and as the card assumed importance over the traveler's cheques, American Express continued to use celebrities, such as Mel Blanc and ballerina Cynthia Gregory. A typical ad for the American Express Card began with a celebrity asking viewers: "Do you know me?" Although he/she gave hints to his/her identity, the star's name was never mentioned except as imprinted on an American Express Card, after which announcer Peter Thomas told viewers how to apply for it. Each ad concluded with the celebrity reminding viewers: "Don't Leave Home Without It." The "Don't Leave Home Without It" slogan was revived in 2005. American Express continues to use celebrities in their ads. Some notable examples include a late 1990s ad campaign with comedian Jerry Seinfeld, including the two 2004 webisodes in a series entitled "The Adventures of Seinfeld & Superman." In late 2004, American Express launched the "My life. My card." brand campaign, and later the "Are You a Cardmember?" brand campaign in 2007 (both by Ogilvy & Mather), featuring famous American Express cardmembers talking about their lives. The ads have featured actors/actresses Kate Winslet, Robert De Niro, Ken Watanabe, and Tina Fey; Duke University basketball coach Mike Krzyzewski; fashion designers Collette Dinnigan and Diane von Fürstenberg; comedian and talk show hostess Ellen DeGeneres; golfer Tiger Woods; professional snowboarder Shaun White; tennis pros Venus Williams, Andy Roddick, and Andre Agassi; surfer Laird Hamilton Manchester United manager José Mourinho; film directors Martin Scorsese, Wes Anderson, and M. Night Shyamalan; singers Sheryl Crow, Alicia Keys and Beyoncé. In 2007, a two-minute black-and-white ad, entitled "Animals" and starring Ellen DeGeneres, won the Emmy Award for Outstanding Commercial. Many American Express credit card ads feature a sample American Express Card with the name "C. F. Frost" on the front. This is not a fabricated name; Charles F. Frost was an advertising executive at Ogilvy & Mather. American Express was one of the earliest users of cause marketing, to great success. A 1983 promotion advertised that for each purchase made with an American Express Card, American Express would contribute one penny to the renovation of the Statue of Liberty. The campaign generated contributions of $1.7 million to the Statue of Liberty restoration project. What would soon capture the attention of marketing departments of major corporations was that the promotion generated approximately a 28% increase in American Express card usage by consumers. In May 2007, American Express launched an initiative called the Members Project. Cardholders were invited to submit ideas for projects, and were told American Express was funding the winning project. American Express supports initiatives to enhance the architectural and cultural heritage, with the aim of raising awareness on the importance of historical and environmental conservation, through the restoration of historical monuments. American Express is a founder sponsor of the global program "World Monuments Watch", launched in 1995 by World Monuments Fund. During the first edition of Corporate Art Awards, in 2016 American Express received by pptArt the Corporate Art Award for its international restoration program. Two rescue workers entering the American Express Tower following September 11 terrorist attack on World Trade Center. Amex House in Brighton, England, was built in 1977. An American Express regional HQ in Sunrise, Florida. In April 1986, American Express moved its headquarters to the 51-story Three World Financial Center in New York City. After the events of September 11, 2001, American Express had to leave its headquarters temporarily as it was located directly opposite to the World Trade Center and was damaged during the fall of the towers. The company began gradually moving back into its rehabilitated building in 2002. The company maintains major offices in Sunrise, Florida, Salt Lake City, and Phoenix, Arizona with its main data centers in North Carolina and Phoenix. AMEX Bank of Canada was founded in 1853 in Toronto. It currently has 3,000 employees in its head office at Sheppard east of Highway 404 in Toronto (relocated from Markham, Ontario (a northern suburb of Toronto where it resided from 1985 to 2015), as well as an office in Hamilton, Ontario. The company began operations as a bank on July 1, 1990, following an order-in-council made by the Brian Mulroney government on November 21, 1988. This decision was not without controversy as federal banking policy at the time would not ordinarily have permitted American Express to operate as a bank. It is a member of the Canadian Bankers Association (CBA) and a registered member of the Canada Deposit Insurance Corporation (CDIC), the federal agency insuring deposits at all of Canada's chartered banks. American Express has several offices in the UK, including a 9-story European Service Center, known as Amex House, in the Carlton Hill area of Brighton, England. It is a large white tower block, built in 1977 and surrounded by several other smaller offices around the city. Amex House deals with card servicing, sales, fraud and merchant servicing. The official Europe, Middle East, and Africa HQ is located in the Belgravia district of Westminster, in central London, at Belgrave House on Buckingham Palace Road, SW1; other UK offices are based in Sussex at Burgess Hill. In November 2009, Brighton and Hove City Council granted planning permission for American Express to redevelop the Amex House site. The Japan, Asia-Pacific, and Australian Headquarters is co-located in Singapore, at 16 Collyer Quay, and in Sydney's King Street Wharf area. The headquarters of the Latin America and Caribbean division is in Fort Lauderdale, Florida. American Express also has a significant presence in India. Its two centres are located at Gurgaon, Haryana and on Mathura Road in New Delhi. The Indian operations of American Express revolves around the back office customer services operations apart from the credit card business for the domestic Indian Economy, arguably the American Express campus in Gurgaon is the largest employee location by head count for Amex and supports business continuity objectives of Amex including during Hurricane Sandy, the center works 24/7 and includes a co-located second building which was recently transferred to a third party service provider but does much work for Amex. In 2008, American Express was named the 62nd best company to work for in the United States by Fortune, ranking it number one for bank card companies. In October 2008, Amex Canada Inc. was named one of Greater Toronto's Top Employers by Mediacorp Canada Inc., which was announced by the Toronto Star newspaper. In 2018, Fortune ranked it the 23rd best company to work for. Anne L. Lauvergeon: founder and CEO of A.L.P. Robert D. Walter: founder and former chairman and chief executive officer, Cardinal Health, Inc.
Ronald A. Williams: former chairman and CEO of Aetna, Inc. In The Sopranos episode, "Mr. & Mrs. John Sacrimoni Request...", Christopher Moltisanti concludes his sale of stolen credit card numbers to Middle Easterners with a quip: "Don't leave home without them!" This statement confuses the Middle Easterners, who are unfamiliar with the ad campaign. The long-running PBS children's TV series Sesame Street parodied the "Do you know me?/Don't Leave Home Without It" ad campaigns with three skits involving a Muppet character holding a Grown-Up Friend's hand while crossing the street. One skit featured Forgetful Jones (performed by Richard Hunt) with Olivia (Alaina Reed Hall) as his Grown-Up Friend, a second featured Bert and Ernie (Frank Oz and Jim Henson respectively) with Gordon (Roscoe Orman) as their Grown-Up Friend, and the third featured Big Bird (Caroll Spinney) with Bob (Bob McGrath) as his Grown-Up Friend. All three skits ended with the grownups' names being embossed at the bottom of a card resembling an American Express card that had a big human left hand in the middle, with the words "Grown-Up Friend's Hand" above it, and a voiceover saying "A Grown-Up Friend's Hand. Don't cross the street without it." Another parody was seen on an episode of the CBS game show Press Your Luck, when the animated "Whammy Character" would give the "Do you know me?" tag line, followed by the display of an Amex card-parody, which then had "WHAMMY" typed in on the bottom line of the card. In the pilot episode of Masquerade, a KGB general says the line, "I suppose you never leave home without it", to a KGB agent when he sees that agent's "National American" card. In a campaign speech during the 1984 election, President Ronald Reagan said "If the big spenders get their way, they'll charge everything to your taxpayer's express card, and believe me, they never leave home without it." In the final episode of The Dukes of Hazzard, Boss Hogg is shot at by a former associate, the bullet striking a wallet he had kept in his pocket and being lodged in several credit cards. Narrator Waylon Jennings takes note of the situation and says, "I bet he's glad he didn't leave home without them" (referring to his credit cards). The 1997 film Hercules shows a "Grecian Express" credit card bearing similar resemblance to the Amex card during the song "Zero to Hero". The 1989 movie Major League also parodied the campaign. In one scene, in which every player is dressed in a tuxedo, the Cleveland Indians tell viewers of the film why every player carries the American Express Card with much of the explanation done one line at a time by players Jake Taylor (Tom Berenger), Eddie Harris (Chelcie Ross), Rick "Wild Thing" Vaughn (Charlie Sheen), Pedro Cerrano (Dennis Haysbert), and Roger Dorn (Corbin Bernsen), and Manager Lou Brown (James Gammon). The scene ends with Willie "Mays" Hayes (a tuxedo-clad Wesley Snipes) sliding into home plate in front of the rest of the team, holding up his card and saying to the viewers: "The American Express Card. Don't steal home without it." In the film Batman & Robin, Batman pulls out a Bat-Credit card and says he never leaves the cave without it. Yakov Smirnoff's book cover, America on Six Rubles a Day (ISBN 978-0-394-75523-6), depicts a Russian card with the slogan "Don't leave home." In the 2017 TV series Riverdale, the credit card is referred to as "American Excess". ^ a b c "US SEC: Form 10-K American Express Company". U.S. Securities and Exchange Commission. Retrieved March 1, 2018. ^ "Dow Jones Industrial Average". CNNMoney.com. Retrieved October 20, 2013. ^ Comoreanu, Alina (March 7, 2017). "Market Share by Credit Card Network". Wallet Hub. ^ "Forbes 2017 Rankings - The World's Most Valuable Brands". Archived from the original on March 8, 2018. ^ "Recognizing Responsibility: American Express Company 2007/2008 Corporate Citizenship Report" (PDF). American Express Co. p. 8. Archived from the original (PDF) on November 16, 2011. Retrieved July 25, 2012. In 1850, three men — Henry Wells, William G. Fargo and John Butterfield — founded an express company in Buffalo, New York to forward freight and valuables across the united States. ^ a b c d Kenneth T. Jackson. The Encyclopedia of New York City. The New York Historical Society: Yale University Press, 1995. P. 23. ^ White, Norval & Willensky, Elliot; AIA Guide to New York City, 4th Edition; New York Chapter, American Institute of Architects; Crown Publishers/Random House. 2000. ISBN 0-8129-3106-8; ISBN 0-8129-3107-6. p.23. ^ a b White, Norval & Willensky, Elliot; AIA Guide to New York City, 4th Edition; New York Chapter, American Institute of Architects; Crown Publishers/Random House. 2000. ISBN 0-8129-3106-8; ISBN 0-8129-3107-6. p.22. ^ Barham, Peter (January 2016). "The impact of the Great War in 1916". Great Eastern Journal (165): 14. ^ Cole, Robert J. (December 3, 1987). "Shearson Reported To Acquire Hutton In a $1 Billion Deal". The New York Times. ^ "Shearson Name may Disappear". The New York Times. November 10, 1993. ^ a b "Our Story" (PDF). American Express. Archived from the original (PDF) on March 3, 2016. Retrieved September 8, 2015. ^ "American Express Platinum Card Packs on the Perks for International Travelers" (Press release). American Express. April 5, 2011. Archived from the original on May 20, 2017. Retrieved April 12, 2017. ^ "First Data History". First Data. ^ Kristof, Kathy M. (September 7, 1994). "American Express Launches New Credit Card". Los Angeles Times. ^ American Express Super Bowl XXV ad feat. Dana Carvey & Jon Lovitz - Travelling (1991). YouTube. April 16, 2016. ^ Leonard, Devin; Dexheimer, Elizabeth (October 15, 2015). "How Bad Will It Get for American Express?". Bloomberg L.P.
^ "American Express, Form 8-K, Current Report, Filing Date Dec 23, 2008" (PDF). Securities and Exchange Commission. Retrieved January 6, 2013. ^ a b Shapiro, Ari. "American Express Gets Fed Approval to Convert to Bank". Morning Edition. Retrieved February 4, 2018. ^ "American Express, Form 8-K, Current Report, Filing Date Jul 29, 2009". Securities and Exchange Commission. Retrieved January 6, 2013. ^ "AmEx Gets Out of TARP; Pays $340M for Warrants". wallstreetpit.com. July 29, 2009. Retrieved August 21, 2009. ^ "AmEx gets out of TARP". CNNMoney. July 29, 2009. Retrieved August 21, 2009. ^ "OFT Warns Credit Card Providers Off 'Charging Orders'". Choose. November 10, 2010. ^ "CFPB Orders American Express to Pay $85 Million Refund to Consumers Harmed by Illegal Credit Card Practices" (Press release). Consumer Financial Protection Bureau. October 1, 2012. ^ Schecter, Barbara; Leong, Melissa (September 18, 2014). "Costco to stop accepting American Express cards in Canada, switches to Capital One and Mastercard". Financial Post. Retrieved October 29, 2017. ^ Strauss, Marina (September 18, 2014). "Costco Canada switches to MasterCard from AmEx". The Globe and Mail. ^ "What to Expect From Costco's New Deal With Visa". San Antonio Express-News. ^ a b "Costco names Citi, Visa as new credit card partners after AmEx deal ends". Los Angeles Times. March 2, 2015. Retrieved July 1, 2015. ^ Garnick, Coral (October 21, 2016). "The Costco effect: How American Express is faring after losing co-branded credit cards". Puget Sound Business Journal. ^ "American Express Revenue 2006-2018 | AXP". www.macrotrends.net. Retrieved October 30, 2018. ^ "Fortune 500 Companies 2018: Who Made the List". Fortune. Retrieved November 10, 2018. ^ Chamberlin, Chris (March 1, 2017). "ANZ stops issuing American Express credit cards". Australian Business Traveller. Retrieved February 4, 2018. ^ "AMERICAN EXPRESS COMPANY ANNUAL REPORT, 2017" (PDF). American express. Retrieved March 13, 2018. ^ "List of Credit Card Companies & Networks: Differences, Contact Info & More". Card Hub. Retrieved September 21, 2014. ^ "Amex Gold Card - American Express Preferred Rewards Gold Card Review UK". Thrifty Points. March 5, 2019. Retrieved April 15, 2019. ^ Tsosie, Claire (August 29, 2016). "What The First Credit Cards Were Like". Magazine. ^ "The Platinum Card® From American Express Celebrates Its 20th Anniversary" (Press release). American Express. July 21, 2004 – via PRNewswire. ^ "Black American Express Card". Snopes.com. December 6, 2006. Retrieved December 11, 2010. ^ Rig, Emma (March 3, 2006). "American Express launches Red Card with digital campaign". Campaign. Retrieved February 4, 2018. ^ Lieber, Ron. "American Express Zync: Will Young Adults Want a Charge Card?". Bucks Blog. Retrieved January 18, 2018. ^ "American Express and Walmart Launch Bluebird®: a New Alternative to Debit and Checking Accounts". Archived from the original on September 11, 2014. Retrieved September 21, 2014. ^ Kopecki, Dawn. (2013-03-26) AmEx Bluebird Customers Get FDIC Backing, Check-Writing Feature. Bloomberg Technology; Retrieved on 2013-08-16; Subscription required. ^ "Denmark: Money and Costs". Lonely Planet. Retrieved February 4, 2018. ^ "British Money". Visit London. April 10, 2007. Retrieved February 4, 2017. ^ "Italy Travel F.A.Q. - What is The Best Way to Get Euros and Pay For Things in Italy?". Dream of Italy. ^ Boyce, Lee (July 22, 2010). "Why don't more places take American Express?". This is Money. Retrieved February 4, 2018. ^ "American Express, Form 8-K, Current Report, Filing Date Oct 22, 2007". Securities and Exchange Commission. Retrieved January 6, 2013. ^ "Official Plum Card Website". Plumcard.com. Retrieved December 18, 2011. ^ Daniel, Ivan. Best American Express Cards For Small Business Get.com. July 7, 2016. Retrieved July 13, 2016. ^ "American Express, Form 8-K, Current Report, Filing Date Mar 27, 2008". Securities and Exchange Commission. Retrieved January 6, 2013. ^ Amex Cuts CEO Pay DeLuna, JoAnn, Business Travel News. March 28, 2016. Retrieved July 13, 2016. ^ a b c d e f Kerr, Tom. Business Benefits of Amex Corporate Cards Archived August 15, 2016, at the Wayback Machine Compare Wallet, July 26, 2017, Retrieved February 4, 2018. This content is not provided by American Express. Any opinions, analyses, reviews or recommendations expressed in this article are those of the author's alone, and have not been reviewed, approved or otherwise endorsed by American Express. ^ American Express Corporate Meeting Card information Retrieved July 13, 2016. ^ American Express Corporate Purchasing Card information Retrieved July 13, 2016. ^ "American Express, Form 8-K, Current Report, Filing Date Jan 22, 2001". Securities and Exchange Commission. Retrieved January 6, 2013. ^ "American Express, Form 10-K, Annual Report, Filing Date Mar 12, 2004". Securities and Exchange Commission. Retrieved January 6, 2013. ^ "American Express, Form 8-K, Current Report, Filing Date Feb 2, 2004". Securities and Exchange Commission. Retrieved January 6, 2013. ^ "American Express, Form 8-K, Current Report, Filing Date Jan 24, 2005". Securities and Exchange Commission. Retrieved January 6, 2013. ^ "American Express, Form 8-K, Current Report, Filing Date Dec 23, 2005". Securities and Exchange Commission. Retrieved January 6, 2013. ^ "Florida Merchant Services Provider Gets Full American Express Acquiring Program". Digital journal. Retrieved June 17, 2014. ^ Frankel, Matthew (June 16, 2014). "Here's Why American Express Can Charge More Than Visa or MasterCard". The Motley Fool. Retrieved February 4, 2018. ^ Longstreth, Andrew (May 7, 2014). "U.S. judge: Government's antitrust suit vs AmEx may proceed". Reuters. Retrieved February 4, 2018. ^ Stempel, Jonathan (January 15, 2017). "U.S. loses bid to overturn AmEx antitrust decision". Reuters. Retrieved February 4, 2018. ^ Wheeler, Lydia (October 16, 2017). "Supreme Court agrees to hear American Express case". The Hill. Retrieved February 4, 2018. ^ Szczypinski, Sarah (August 25, 2016). "Are Traveler's Checks Still a Thing?". Yahoo! Finance. Retrieved May 6, 2018. ^ "American Express, Form 8-K, Current Report, Filing Date Oct 24, 2005". Securities and Exchange Commission. Retrieved January 6, 2013. ^ "American Express, Form 8-K, Current Report, Filing Date Sep 18, 2007". Securities and Exchange Commission. Retrieved January 6, 2013. ^ Clark, Andrew (September 18, 2007). "Standard Chartered buys American Express Bank". The Guardian. London. ^ "Frequently Asked Questions on the Standard Chartered Bank acquisition of American Express Bank" (PDF). American Express. Archived from the original (PDF) on December 15, 2013. Retrieved January 11, 2012. ^ "Auditors' Report on the financial statements of Standard Chartered Bank – India Branches under Section 30 of the Banking Regulation Act, 1949, Page 7, Economic & Political Weekly EPW June 28, 2008" (PDF). Standard Chartered. Retrieved January 11, 2012. ^ "Standard Chartered completes acquisition of American Express Bank for $823 million". Standard Chartered Bank. March 3, 2008. ^ "Media It's Official: Time Inc. Buys AmEx's Food & Wine, Travel & Leisure Magazines". Advertising Age. September 10, 2013. Retrieved February 4, 2018. ^ "American Express, Form 10-K, Annual Report, Filing Date Feb 24, 2012" (PDF). Securities and Exchange Commission. Retrieved January 6, 2013. ^ Steigrad, Alexandra (February 5, 2014). "Time Inc. Lays Out Restructuring". Women's Wear Daily. Retrieved February 4, 2014. ^ Bruno, Ken (May 29, 2010). "Best-Loved Advertising Taglines". Forbes. Retrieved May 6, 2018. ^ "American Express commercial featuring Mel Blanc". OCLC 715152953. ^ Perlmutter, Donna (January 4, 1987). "Cynthia Gregory At 40: 'I Did It The Hard Way'". Los Angeles Times. Retrieved May 6, 2018. ^ Schlichter, Jay (May 2, 2016). "Famed voice-over icon Peter Thomas dies at 91". Naples Daily News. Retrieved May 6, 2018. ^ Grundhauser, Eric (October 2, 2015). "How Advertising Invented 8 Phrases We Use Every Day". Atlas Obscura. Retrieved May 6, 2018. ^ McMains, Andrew (April 6, 2007). "Ogilvy Changes AmEx Tagline". Adweek. Retrieved May 6, 2018. ^ a b c "American Express Campaign by Ogilvy - 04/2009". Ads of the World. Retrieved May 6, 2018. ^ "American Express - Robert De Niro". splendAd. Retrieved May 6, 2018. ^ Tina Fey American Express Commercial. YouTube. July 1, 2010. ^ "American Express - "Coach K"". adforum. Retrieved May 6, 2018. ^ American Express Collette Dinnigan. YouTube. October 28, 2008. ^ "American Express - Diane von Furstenberg". splendAd. Retrieved May 6, 2018. ^ "American Express - Ellen's Dance". splendAd. Retrieved May 6, 2018. ^ "American Express - "Tiger Woods"". adforum. Retrieved May 6, 2018. ^ Shaun White American Express Commercial. YouTube. June 3, 2007. ^ Venus Williams (2004 American Express ad). YouTube. February 15, 2010. ^ Roddick vs Pong. YouTube. May 28, 2006. ^ a b "American Express - "The Members Project"". adforum. Retrieved May 6, 2018. ^ American Express Card by José Mourinho. YouTube. May 13, 2008. ^ Martin Scorsese American Express. YouTube. September 23, 2007. ^ "American Express - Wes Anderson". splendAd. Retrieved May 6, 2018. ^ "American Express - M. Night Shyamalan". splendAd. Retrieved May 6, 2018. ^ Beyonce's American express commercial. YouTube. October 4, 2007. ^ "59th Emmy Awards Nominees and Winners: Outstanding Commercial - 2007". Academy of Television Arts & Sciences. Retrieved February 4, 2018. ^ Adams, Cecil (December 16, 1983). "Who is C. F. Frost, whose name appears on sample American Express cards?". The Straight Dope. Retrieved February 4, 2018. ^ Hessekiel, David (January 31, 2012). "Cause Marketing Leaders of the Pack". Forbes. Retrieved August 18, 2013. ^ "Members Project from American Express". Facebook. Retrieved January 9, 2012. ^ Peetu. "American Express Rewards". American Express Rewards. Archived from the original on December 19, 2011. Retrieved December 18, 2011. ^ "Winner of the 2016 edition of the Corporate Art Awards". ^ Collis, Rose (2010). The New Encyclopaedia of Brighton. (based on the original by Tim Carder) (1st ed.). Brighton: Brighton & Hove Libraries. p. 9. ISBN 978-0-9564664-0-2. ^ "100 Best Companies to Work For". CNN Money. Retrieved October 9, 2008. ^ "Reasons for Selection, 2009 Greater Toronto's Top Employers Competition". Eluta.ca. ^ "American Express Company Ownership Summary". NASDAQ. Retrieved April 30, 2018. 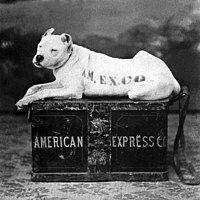 Wikimedia Commons has media related to American Express.